To give a boost to administrative reforms initiated in Punjab, Deputy Chief Minister Sukhbir Badal today said that the right to service Act would soon be introduced in the state. A delegation of the SAD today lodged a strong protest with US Ambassador Timothy J Roemer. SGPC chief Avtar Singh Makkar today gave a call to all Sikhs settled across the world to lodge protests against the frisking of turbans in their respective countries. He also announced that the SGPC would stage a massive dharna outside the US Embassy in Delhi on December 23 to lodge a protest against the frisking of Sikhs’ turbans. The Sikh clergy today asked the SGPC to intensify the efforts for the implementation of the Anand Marriage Act to facilitate a special provision for the registration of marriages performed under Sikh religious rights. A discreet random survey is being conducted by a private organisation on behalf of the Congress to assess the political mood and important concerns of people at this stage when the Assembly elections are 14 months away in the state. Promises made by the Punjab Government to provide basic infrastructure to the government primary schools have fallen flat as many children studying in government schools are forced to sit on ground in the chilly weather. The decreasing temperature has caused more problems for school children and teachers. The result of this is the decreasing attendance of school children these days. Punjab is keen on going the Bihar Chief Minister Nitish Kumar way as far as taking welfare steps is concerned.The state government has directed the authorities concerned to prepare a proposal to provide bicycles to all girl students in Classes VIII to XII. The Punjab Governor is yet to forward the list of six advocates and a sessions judge in line for elevation as Punjab and Haryana High Court Judges to the state Chief Minister. Hundreds of residents, including farmers, held up traffic on the main road here today demanding a review of the Sultanpur Lodhi Tourism Infrastructure and Cultural Heritage Conservation, Development and Management Plan 2010-2035. Deputy Chief Minister Sukhbir Singh Badal has directed the enhancement of the first instalment of pay arrears to state government employees from the earlier stipulated level of 33 to 40 per cent. The first instalment will be paid with the salary of April, 2011. Villagers of Dher village staged a dharna against police demanding arrest of accused in case of alleged murder of sarpanch of Ganuran village for dowry. The biomass power plants, running in the state, are incurring losses due to lack of fuel, security and disparity in the power tariffs between different plants. Despite court orders prohibiting dharnas in a distance of 100 meter radius from the Punjab State Power Corporation Limited (PSPCL), the agitating members of the Unemployed Employees Union, Punjab, held a dharna at the Mall Road outside PSPCL headquarters. Six years after 37 youngsters in search of greener pastures across the seas lost their way, the Punjab and Haryana High Court has asked the Union of India to make all-out efforts to “trace the missing youths”. The Ropar police has lodged a daily diary report (DDR) against a former Member of the Parliament from Patiala, Atinderpal Singh. His name figures for distributing literature on the radical Sikh chief, Jarnail Singh Bhindranwale, in Nangal. The move has been initiated with the aim of empowering residents of the state to claim services by different agencies as a matter of right, with a provision to penalise government officials who deny, delay or fail to deliver services to the residents. While stating this at a function organised in connection with the launching of development works and laying the foundation stone of the office of the local municipal council in his home constituency, Badal said the SAD-BJP government would not tolerate any attempt to defeat the purpose of its people-oriented policies. “The right to service Act is a natural extension of exercise of administrative reforms to ensure hassle-free services to the people of Punjab. The services meant for citizens, who will be covered by this proposed Act, are being identified and shortly the government will be ready with its draft for further action,” pointed out the Deputy Chief Minister. Sukhbir demanded that an all-party meeting must be called at the national level to work out the modalities to stop the repeated hikes being made in the prices of petrol and diesel by the UPA government. The hikes had been proving detrimental for agriculture and transport business besides triggering inflation. “Why does the UPA government fail to reduce the prices of diesel and petrol whenever they become cheaper in the international market? This shows that they are anti-people and are befooling the people by making false promises,” alleged Sukhbir. A delegation of the SAD today lodged a strong protest with US Ambassador Timothy J Roemer regarding the “discriminatory instructions” of the US Administration to pat-search the turbans of Sikhs at airports in the US. A statement of the US Ambassador Roemer said that he “regretted” any inconvenience that may have resulted for Hardeep Singh Puri or Meera Shankar as a result of the recent incidents. He reaffirmed the commitment to provide thorough and “respectful” screening, while adding that the US strived to balance respect for all religions and cultures with “our need to ensure the security of all travellers”. In a memorandum submitted to the US on behalf of SAD president Sukhbir Badal, the leaders of the Delhi state unit of the SAD said while Sikhs appreciated the US Government’s decision to step up security at the airports, it was highly insensitive particularly to Sikhs and they were humiliating Indian ministers, diplomats and particularly those belonging to the Sikh community. The memorandum said the US Government should make their airport security aware through special sensitisation exercises that a turban was an inseparable part of a Sikh. It suggested that the US Government should devise do’s and don’ts while frisking Sikhs at airports or elsewhere. Roemer’s statement said he had conveyed his respects to representatives of the SAD and noted the party’s concerns. Makkar was here to attend a function organised at Maharaja Ranjit Singh Khalsa Technical College to felicitate him for a sixth successive term as the SGPC chief. Reacting to a recent incident involving Indian diplomat Hardeep Singh Puri, who was asked by the US airport security officials to remove his turban as part of frisking, the SGPC chief said such cases outraged Sikh religious sentiments. Speaking further, he said while lodging a protest outside the US Embassy, they would also call upon the Government of India to undertake a comprehensive diplomatic initiative to put a decisive end to such cases. The matter came up during a meeting of the Sikh high priests at Sri Akal Takht here following correspondence in this regard from Harbans Singh Aujla of Toronto, who has been trying to get the Act implemented, and other Sikh leaders. At present marriages performed under Sikh religious rites are registered either under the Hindu Marriage Act or the Special Marriage Act. Interestingly, Pakistan has taken the lead over India by adopting the amended Anand Marriage Act in January 2008. The Sikh high priests praised the human rights organisation, Sikhs for Justice, for making an endeavour along with the All- India Sikh Students Federation to bring the culprits of 1984 riots to book. They commended the campaign launched by these outfits to file a petition with the United Nations Human Rights Commission, seeking recognition of 1984 riots as genocide under Article 2 of the UN Convention and seeking an impartial probe into the killing of Sikhs. Akal Takht directed the Sikh community to extend its full support to the campaign. The turban issue also came up for discussion at the meeting which appealed for unity among Sikhs to deal with the prevailing situation. The Sikh high priests emphasised on a concerted effort to find a proper and respectable solution to the ban on turban in France and frisking of turbans on the pretext of security in the US. They appealed to gurdwara committees and Panthic organisations to participate in large numbers in the protest march in this regard outside the US Embassy in New Delhi on December 23. In another significant move, the Sikh clergy urged for observing the martyrdom of Sahibzadas at Fatehgarh Sahib solemnly. They said the ‘langar’ prepared on the occasion should be simple, while the great sacrifice of the Sahibzadas should be highlighted from political stage as well. This is being seen as a message to the political parties to refrain from political mudslinging during their conferences on the occasion. The meeting could not reach a conclusion on the row surrounding Delhi Sikh Gurdwara Management Committee (DSGMC) chief Paramjit Singh Sarna’s allegations against noted lawyer HS Phoolka. Sri Akal Takht Jathedar Giani Gurbachan Singh said the report submitted to them by a five-member committee of Sikh scholars in this regard was incomplete and they could only reach a conclusion after hearing all the sides. Sarna had alleged that Phoolka was given a huge amount of money to contest the cases of the victims of 1984 riots, a charge denied by the latter. Meanwhile, Patna Sahib Jathedar Giani Iqbal Singh was conspicuous by his absence at the meeting. He was not invited to the meeting in view of his controversial edict over Raagmala. He confirmed that he did not receive any invitation for the meeting. The Sikh high priests steered clear of the Raagmala row at the meeting. Sources said the survey had been ordered by the Congress high command. Party General Secretary Rahul Gandhi is known for ordering behavioral studies to assess his party’s prospects well before Assembly elections in various parts of the country. The sources said the survey teams had visited important Assembly constituencies, including Jalalabad from where Deputy Chief Minister Sukhbir Singh Badal had won a byelection by a huge margin. The teams have also visited the Bathinda Urban and Ferozepur city constituencies. The teams will also visit Talwandi Sabo, Maur, Lehragaga, Patiala and other important core constituencies of the Malwa region. Separate teams would be sent to conduct a survey in the Doaba and Majha regions. The survey teams have asked people about the performance of the incumbent government, especially with regard to development, law and order and delivery of various services. The teams are focusing on the quality of governance. On the basis of the feedback, the Congress will plan its strategy with regard to the Assembly poll. “It appears to be a preliminary survey just to prepare the strategy. There may two or three more surveys conducted later to assess changes, which is a common feature during the election year, in the political mood of people,” said a Congress leader. “In fact, this time besides assessing the mood of people, other important factors will be the number of political combinations in the election fray”, he added. The sources said the teams had also asked about the personal behaviour of prominent political leaders of various parties, their integrity and overall reputation, including involvement, if any, in anti-social or criminal activity. Promises made by the Punjab Government to provide basic infrastructure to the government primary schools have fallen flat as many children studying in government schools are forced to sit on ground in the chilly weather. The decreasing temperature has caused more problems for school children and teachers. The result of this is the decreasing attendance of school children these days. A visit to some government primary schools reveals that classrooms lack sunlight and seating arrangement. “We have to force children to sit on the cold ground. Despite repeated requests to provide furniture, nothing has been done in this regard,” said a government school teacher in Khamano block. The teachers said schools lacked power and have to keep the doors and windows open for sunlight. During winters, children sitting on the ground shiver and fail to study following the chill in the air. They fall ill and fail to attend classes affecting results. Such is not the situation only at one or two schools, but several primary schools across Punjab still do not have adequate furniture. Schools students were found studying even without rugs. 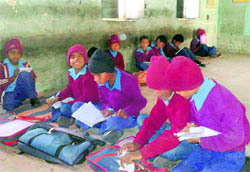 Admitting the problem District Education Officer (DEO) Primary, Harvinder Kaur, said there were few schools deprived of furniture and students were made to sit on the ground. “We fail to get funds to provide furniture to the primary schools. However, the senior functionaries of the education department have assured to provide furniture in all schools by next year,” Harvinder said. Sources said the issue to provide bicycles came up at a meeting of the Welfare Department held under the chairmanship of Deputy Chief Minister Sukhbir Singh Badal. A senior Akali leader, who attended the meeting, told The Tribune here today that a bicycle manufacturer also attended the meeting. He offered to supply bicycles at a price varying between Rs 2,200 and Rs 2,400 per bicycle. The sources said Sukhbir Badal had directed the authorities concerned to collect data on the girl students from the Education Department and prepare a proposal to enable the Finance Department to allocate money for the project. According to an estimate, there are about 10 lakh girl students in government and private schools in Classes VIII to XII. Obviously, the bicycles are planned to be given from the next academic session that would start in April 2011. Nitish Kumar was the first to provide bicycles to girl students. The other important issue discussed at the meeting was with regard to make allocation in the budget for the welfare of the Scheduled Castes in direct proportion to their population on the Maharashtra pattern. An Akali leader said they impressed upon the Deputy Chief Minister to set up a welfare board for poor sections. A promise in this regard was made in the SAD manifesto. A demand was also made by Akali MLAs to set up a safai karamchari commission on the Central pattern. According to the information, the file is still in the governor’s office and has not been forwarded to the Chief Minister for his consent. It is believed the list was sent to the state governor more than a fortnight ago, after the Punjab and Haryana High Court cleared the names. The Tribune was the first to report that the list has been forwarded to the state for its nod. The list was sent less than a month, after the collegian met practically after a gap of nearly three years, to clear the names for elevation. It was sent to the governors, even as the Chief Justice, heading the collegian, was at the end of the tenure. In fact, the Chief Justice is scheduled to retire upon attaining the age of superannuation early next year. Rather, the Chief Justice will move out of the high court immediately after it reopens at the end of the winter break in January. As of now, the high court has about eight working days before it closes down. This is not the first time that an outgoing Chief Justice has recommended names for elevation. Earlier also, the then Chief Justice of the Punjab and Haryana High Court, Justice Vijender Kumar Jain, had recommended names of six district and sessions judges for elevation at the end of his tenure. His move was strongly opposed by the then Punjab Governor Gen (retd) S F Rodrigues. At that time, the Governor was of the opinion that Chief Justice Jain was on his way out and Justice Tirath Singh Thakur was set to take over as the new Chief Justice. As such, the recommendations should come from him. The plan envisages razing the entire main market to make way for a 165 ft tree lined promenade along the historic Kali Bein leading to Ber Sahib gurdwara where Guru Nanak attained enlightenment. Even a proposed ring road that will lead to razing of hundreds of shops and residential houses and landmarks of historical importance is opposed by the protesters. However, the buildings likely to be pulled down include the decade-old state guest house, the SDM and BDO complex, the BSNL exchange, several local hotels and eateries and even some ancient landmarks. Speaking on behalf of the over 300 strong Vishkarma Market Committee, Harbhajan Singh, Nirmal Singh, Baldev Singh Khalsa, Rajinder Singh and Kulbir Singh said they had set up shop nearly two decades ago and today when their ventures were flourishing they were being targeted by the state in the name of development and conservation. “There is hardly any industry here and we alone cater to the needs of the surrounding villages,” they pointed out. Meanwhile, mediapersons had to face the ire of SDM KS Chandi when they went to his office to seek his version on the protest. He reportedly used abusive language and even pushed away the cameraperson of a national TV channel. The Sultanpur Lodhi scribes union has decided to boycott the SDM till the former tenders an apology. The employees and pensioners are to get arrears due to a hike in pay from 1-1-2006 to 31-7-2009 as per the recommendations of the 5th Pay Commission amounting to over Rs 7,200 crore. A decision to this effect was taken at a meeting with representatives of the Mulazam Front, Punjab. According to the decision, the arrears will be paid in three instalments of 40, 30 and 30 per cent, payable in May 2011, May 2012 and May 2013, respectively. Angry villagers blocked the Nangal-Anandpur Sahib highway for over two-and-a-half hours. The mob protested against the police and alleged that the accused was not being arrested due to some influence. It was only after SP (D) GS Grewal asserted villagers that action would be initiated against the accused that the villagers lifted dharna.“If the accused are not arrested in next two-days, we will intensify our stir,” a protester said. In his complaint to the Nurpur Bedi police on December 6, victim’s father, Manjit Singh, said he had married his 27-year-old daughter, Maninder Kaur, to Amrik Singh three years ago. The couple has a two-year-old daughter, Ravneet Kaur, from the wedlock. He alleged that since the early days of marriage, Amrik and his parents had been troubling Maninder for dowry. She had repeatedly told her father about the treatment meted out to her at her in-laws’ place. Punjab has two kinds of plants including independent power producing (IPP) plants and the co-generation plants. The IPP are given the rights to produce power only. The co-generation plants utilise power generated for their own industries and sell the same. The nodal agency for these projects, Punjab Energy Development Agency (PEDA), had announced setting up 27 such power plants in the state in the next two years. Of these, five are in the pipeline and are likely to be commissioned by next year, whereas sustainability of present plants is at stake. General manager of Malwa Power, the first IPP commissioned in 2005, Balwan Singh Jangar said most of the plants used farm waste as the raw material of biomass.“At Malwa Power, we use 25 kinds of biomass. Since 2007, the prices of biomass have increased over three times. It is difficult to arrange bio fuel round-the-clock,” he observed. Deputy general manager of Ambuja Cement’s captive power plant at Ropar, Balbir Singh Rana, said many of these power plants were close to shutting down due to lack of bio fuel security.“Neither the state nor Centre has any promotional activity in this regard. Against the installed capacity of 24 MW, we are producing 15 MW and our 80 tonnes boiler is closed,” he said. Rana said the government had imposed a .70 paise charge on trading power outside the state, making it impossible to sustain the biomass plants. The government has introduced a different tariff card for the new players in market. This is being seen as a way to benefit a plant belonging to a SAD leader in Malwa. While the older plants sell power at Rs 3.49 per unit, the new plants are given the rate of Rs 5.50 per unit. When taken into account with the fuel, the amount input cost of older plants exceed far more than the new ones. PSPCL authorities have filed a contempt of court application against the protesters outside their head-office, which would come up for hearing on December 21. Making a mockery of the District Administration and the law enforcing agencies, the union members started gathering at the Mall Road and raised anti-government slogans. The dharna was lifted in the evening after the officials met the protesters. The police deputed at the venue claimed that till the time they get orders to disperse the agitators, they were helpless. “We have enough security and equipment but were standing here as mute spectators,” they said. Agitated over the non-issuance of appointment letters to 5,000 unemployed linesmen, representatives of the Unemployed Employees Union, Punjab, claimed that on October 27, Punjab Chief Minister Parkash Singh Badal had conveyed to the union that within 10 days, 5,000 linesmen would be recruited on contract basis at a salary of Rs 10,000 per month in PSPCL, but was done in this regard. Press secretary for the union, Nirmal Singh, said members from the all districts had reached here and they would intensify their agitation if their demands are not meted out by the government at the earliest. Acting on a petition filed in public interest, a Division Bench asked the Centre to make an endeavour to track them down through the embassies concerned. The Bench of Chief Justice Mukul Mudgal and Justice Ranjan Gogoi also asked the State of Punjab to come out with a status report with details on the interrogation of the suspects. For the purpose of filing the report, the Bench gave the state three weeks’ time. The Bench also fixed January 27 next year as the date of hearing. The All-India Forum for National Reconciliation has filed the petition in the public interest on the disappearance of 37 Spain-bound youngsters in November 2004. The High Court has already been informed that the Punjab Police approached the CBI for locating the missing persons. The premier investigating agency, on the other hand, intimated Interpol. In its petition against the Union Ministry of External Affairs, the Ministry of Home, the state of Punjab, the CBI and other respondents, the forum is seeking directions for ascertaining the whereabouts of the missing youths. The petitioner has alleged the youngsters fell prey to unapproved, self-proclaimed travel agents, who defrauded them and exploited them by promising greener pastures abroad. It was submitted in the petition that the 37 youths were taken away by the travel agents allegedly to Spain in October 2004 and one of them, Charanjit Singh, contacted his family on the telephone from Mali in North Africa in December 2004. Available information suggests the families of the missing youngsters hail from the Doaba region of the state. In fact, most families are from villages in Nawanshahr, Hoshiarpur, Kapurthala and Jalandhar districts. Already, a former Judge, Justice Amar Dutt, has moved the High Court on the issue of Indians bound for foreign lands. In a separate petition, Justice Dutt has asked for initiation of “immediate necessary steps” for the early release and return of more than one lakh men and women mostly from Punjab belonging to Jalandhar, Nawanshahr, Gurdaspur, Hoshiarpur, Kapurthala and Amritsar districts. The area residents brought this matter into the notice of police. The police officials brought the complainants and the alleged accused in the police station and enquired into the matter. Ropar SSP JS Aulakh said a DDR had been lodged and the matter would be brought into the notice of District Authority (legal) and further action would be initiated accordingly. Meanwhile, Hindu organisations held a meeting and condemned Atinderpal’s action of spreading message of separate Khalistan state.